SPRINGFIELD — Springfield-based Hot Table, a chain of fast-casual dining locations, will expand this fall with two new stores in Hadley and Glastonbury, Conn. The Hot Table team, brothers John and Chris DeVoie, opened their original restaurant, featuring signature paninis, in Springfield’s 16 Acres neighborhood in 2007. They followed up with a store in downtown Springfield in 2009, and another in Enfield, Conn. in 2012. They are now hoping to grow upon that success by opening their fourth and fifth locations in the heart of two of the busiest shopping districts in the Hartford/Springfield region. The Glastonbury store will be located in the Griswold Shoppes on Main Street, next to Bertucci’s, and is slated to open in early September. The Hadley store will be located in a new plaza on Route 9, in front of Home Depot, and will open in November. A cross between Panera Bread and Subway, Hot Table specializes in grilled panini sandwiches that are made-to-order for each customer. The stores also offer fresh, made-to-order salads, soups, desserts, and a variety of specialty coffees. The fast-casual style of service at Hot Table is designed to ensure that the diner has quick service and the freshest of ingredients. Each location will employ about 20 people. Hours of operation will be Monday through Saturday, from 7:30 a.m. to 9 p.m.
Springfield-based FIT Solutions LLC announced that Meghan Fallon has joined the company as a Technical Recruiter. In her new role, Fallon will be responsible for sourcing technical talent in the information technology field for FIT Solution’s client base in Massachusetts and Connecticut. She brings with her several years of staffing and recruiting experience across a wide spectrum of industries. She has a bachelor’s degree from UMass Amherst in sociology and communications. The regional law firm Bacon Wilson, P.C. announced that Todd Ratner, Esq. has been honored by Massachusetts Lawyers Weekly as a 2014 “Excellence in the Law” honoree. This event recognizes 25 up-and-coming attorneys for their outstanding accomplishments in the legal community in 2013. Ratner is a member of Bacon Wilson’s Estate Planning and Elder Law department whose practice includes sophisticated estate-planning issues. Additional areas of practice include commercial and residential real estate together with general business and corporate law. Ratner serves on the boards of many charitable entities, including co-chair of the Alzheimer’s Assoc. Tri County Partnership, is a graduate of the Affiliated Chambers of Commerce of Greater Springfield’s Leadership Institute 2007, and taught elder law at American International College. 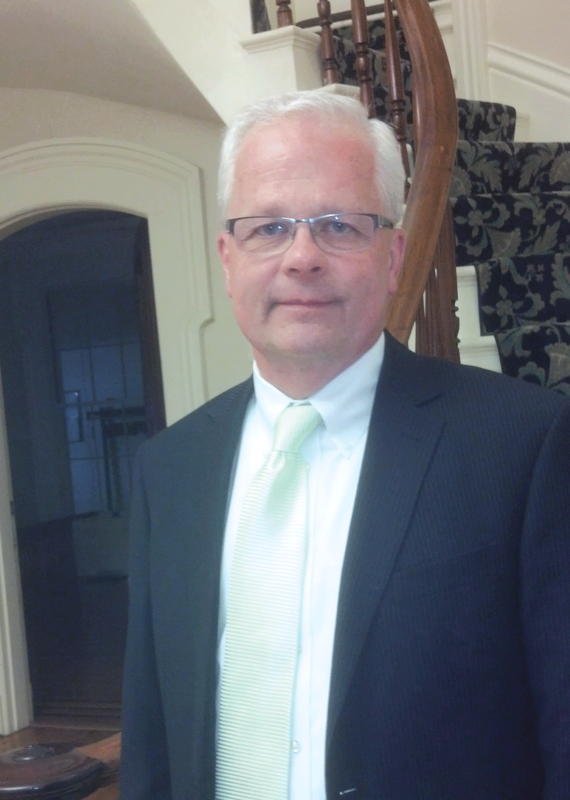 He is a frequent lecturer and has written numerous business, estate-planning, and real-estate articles. Ratner earned his JD from the Pennsylvania State University School of Law, his MBA from Boston University Graduate School of Management, and his bachelor’s degree from Babson College. With 40 attorneys, Bacon Wilson, P.C. is the largest law firm in Western Mass. The firm’s four offices are located in Springfield, Westfield, Northampton, and Amherst. An architect’s rendering of the Phoenix Charter Academy that will take shape in the Technology Park at Springfield Technical Community College. When Beth Anderson conceived what became the Phoenix Charter Academy more than a decade ago, the goal was to create an environment where young students who had failed in the traditional high-school setting, often repeatedly, might overcome their challenges and move on to pursue a college education. It was a laudable concept, but one she wasn’t at all sure would actually work. And as she commenced a search for a place to fulfill this dream in the city of Chelsea, it became abundantly clear that few others were sure it would work either. Eventually, space was secured in the former Assumption School, and Phoenix opened its doors in the fall of 2006. Conditions were not ideal — in fact, they were far from it. But the school’s staff and those first 75 students persevered, and soon Phoenix began making real headway toward meeting its stated mission. 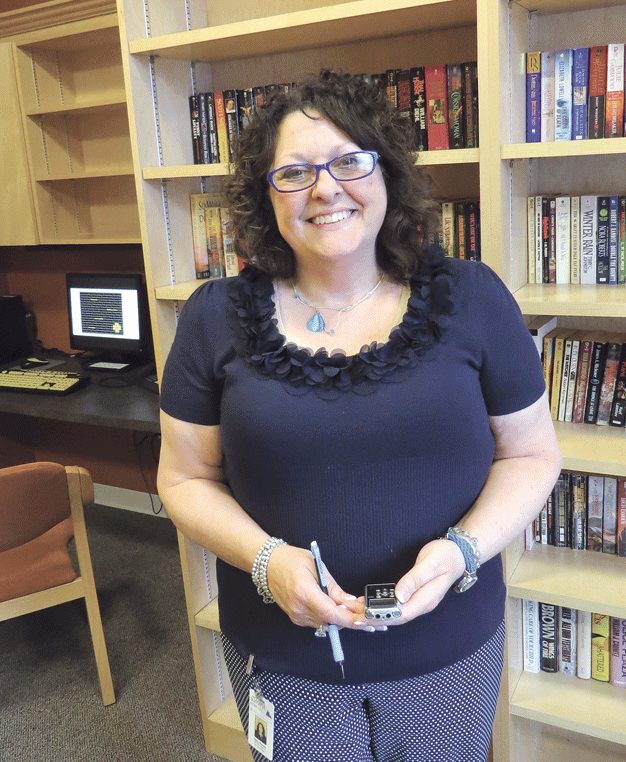 In the process, said Anderson, she and other administrators learned invaluable lessons about creating an environment where students could not only learn, but also aspire to excellence. Fast-forward to the fall of 2012, and Anderson and her staff had those lessons clearly in mind as they went about searching for space in which to expand the Phoenix network in Western Mass. The charter was extended to include Springfield, Holyoke, and Chicopee, communities that have large numbers of at-risk students and struggling school systems, and school officials focused their search for space in the City of Homes. A few months later, that search ended in what some might consider an unlikely location — the Technology Park at Springfield Technical Community College, and, more specifically, long-vacant space once occupied by Springboard Technologies, or at least a big part of what will be left of that building after a large portion of it is razed. Indeed, the Phoenix facility will become the cornerstone of an imaginative reuse plan for the 110,000-square-foot Springboard building — a.k.a. Building 104 in the former Springfield Armory complex that was also once home to Digital Equipment Corp. — which has been vacant since early 2009. Plans call for razing roughly 70,000 square feet of the structure — the middle portion of the building — then creating a temporary home for Phoenix in 16,000 square feet of surviving space on the south end of the site (classes are expected to begin in mid-August), while also building out a permanent home for the school in 30,000 square feet of Building 104 left standing on the north end. The school’s temporary quarters will then be leased out to new tenants. Bob Greeley, leasing agent for the Tech Park, stands in front of the portion of Building 104 that will soon be coming down. Meanwhile, that space in the middle will be converted into roughly 300 parking spaces, replacing roughly the number that will be lost to the college and the Tech Park when a parking lot that was leased by the school off Walnut Street is redeveloped into a grocery store for the Mason Square neighborhood. 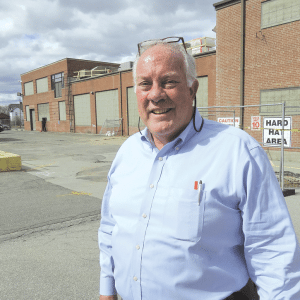 Considering all that, Paul Stelzer, president of Holyoke-based Appleton Corp., which manages the tech park for its owner, the STCC Assistance Corp., called this series of developments a “win-win-win” scenario, with maybe a few more ‘wins’ as well. He counted Phoenix, the college, the Mason Square area, and the city as a whole among those that will benefit from these projects in one way or another, while the Tech Park itself will get a new look and new opportunities to expand its tenant base. Challenges remain for those operating the Tech Park — Western Mass. Electric Co., which moved in more than a decade ago, will soon be vacating more than 15,000 square feet of space serving as its headquarters — but the complex (not including Building 104) is more than 90% occupied, and the WMECO space and remaining portion of Building 104 create possibilities for bringing new companies, and jobs, to a region that needs them. For this issue and its focus on commercial real estate, BusinessWest looks at what is shaping up to be an intriguing next chapter for the Tech Park, and possible subsequent developments for the historic facility. Since Springboard closed its doors in 2009 after struggling and downsizing for several years, and even well before that as the demise of the company became increasingly apparent, Building 104 has been a persistent challenge for Tech Park managers trying to reposition that space and generate needed revenue. The space became a source of controversy and even contentiousness as the assistance corporation offered it as an alternative location for the state-operated data center that was eventually built at the site of the former Technical High School. 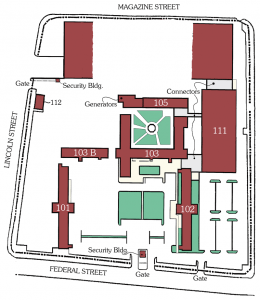 U.S. Rep. Richard Neal pushed hard for the Tech High site, and eventually prevailed in what became a bitter fight over where the center would be located. In the years since, there has been little interest in cavernous Building 104, used for manufacturing by both Digital and the Armory, primarily because there is a glut of such space on the market — and has been since the start of the Great Recession — and the Tech Park space is generally not able to compete with such properties on price, said Bob Greeley, owner of R.J. Greeley Co., long-time leasing agent for the park. However, a new vision for the property began to take shape starting in late 2012, as plans for the neighborhood grocery store — a project pushed by city officials and agencies such as DevelopSpringfield — started to come together and, later, when Anderson and her staff began a hard search for a location in which to create Phoenix’s Springfield facility. 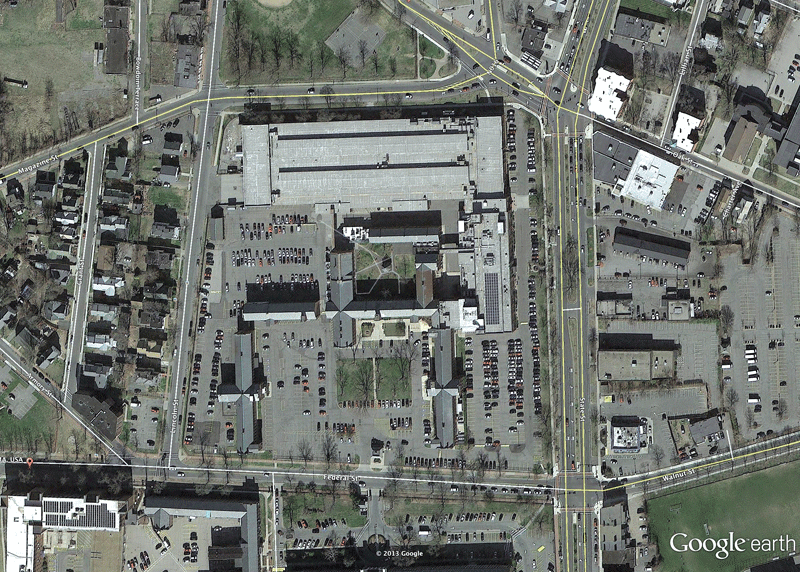 The aerial photo at left shows the massive Building 104 at the top of the image. At right is a site map showing what the park will look like when a large section of the building is razed. The assistance corporation applied for and received a $3.86 million infrastructure grant from the state to essentially move the parking facilities off Walnut Street into the Tech Park, said Stelzer, adding that the funding will cover the costs of demolition and creating a new parking lot. When those funds were secured, work commenced with the National Park Service and state and local historical commissions on how the assistance corporation would adaptively reuse the park and how demolition would be accomplished and also remain sensitive to the historic nature of the site for the Armory days. Meanwhile, park administrators started working on a viable plan for repositioning the portions of the building that would be left standing, said Stelzer, adding the charter school presented itself as an attractive option. That population consists of students who have struggled in a traditional high-school setting, said Anderson, noting that many have dropped out for various reasons, such as academic issues, teen pregnancy, and others. The school presents an alternative for such individuals, she went on, adding that the model involves a blend of rigorous academics — a longer school day and year, advanced-placement classes, college-class dual-enrollment options, and a strict culture — with social and emotional supports for each student. Sara Ofusu-Amah, chief operating officer for Phoenix, said the school is planning to open in its temporary quarters on August 15, with the goal of being in the permanent building in January. Already, 88 students have enrolled — a number that reinforces the perceived need for such a facility — and school officials believe they will easily reach their target of 125 for the fall semester. The permanent facility will include several classrooms, she said, as well as an on-site day-care facility for the children of students, a small library, a student-support center, science labs, and multi-purpose space school officials call the ‘nest,’ which will serve as the gym, auditorium, and meeting space. While work begins to demolish the middle 70,000 square feet of Building 104 and outfit the south portion of the property as the temporary home for Phoenix, Greeley is seeking new tenants for the space occupied by WMECO, which is slated to move out in June. The space was formerly part of a large call center operated by RCN, and while it’s attractive and well-appointed, it brings some challenges as well, said Greeley. There are a number of small offices and conference rooms, he noted, which would make it ideal for use as a corporate headquarters. However, many companies today favor more open floor plans to facilitate communication between employees and improve work flow. The space may also prove difficult to subdivide because of the way it’s laid out, he went on, adding quickly that the space gives the park some valuable inventory at a time when the economy is showing signs of life and many businesses are possibly gaining the confidence to move forward with expansion plans and new initiatives. It’s unlikely that those who conceptualized the Tech Park and were there when the ribbon was cut in 1996 could have imagined the developments unfolding on the site today. Then again, the park has always been a work in progress, a regional asset that has evolved as the region’s economy and business community have. It’s an evolutionary process that continues today. In other words, a site already steeped in history is continuing to write more of it. 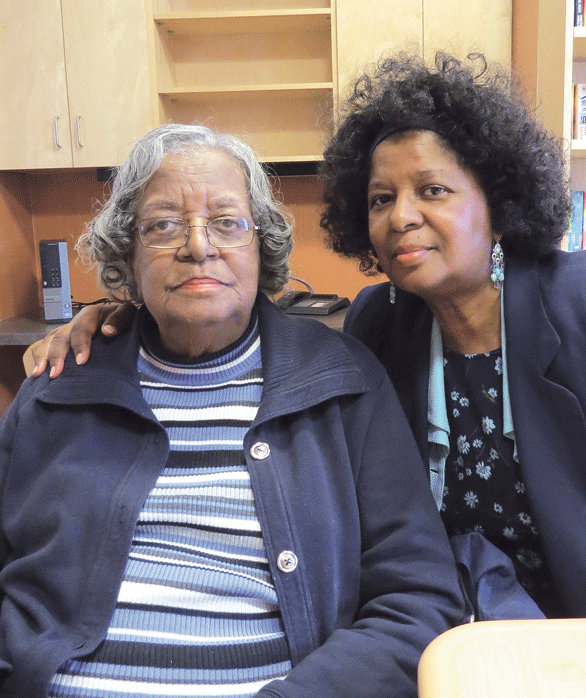 Pam White and her mother, Helese, in the library at Summit ElderCare in Springfield. Pam White is an only child, and is still many years from being in a position to retire. Which means that she faces some significant challenges in her role as caregiver for her mother, Helese, who has several health issues, but is neither ready nor willing to move into a nursing home. Pam told BusinessWest that, as she launched a search for a solution to her dilemma, she did so with a specific mindset. 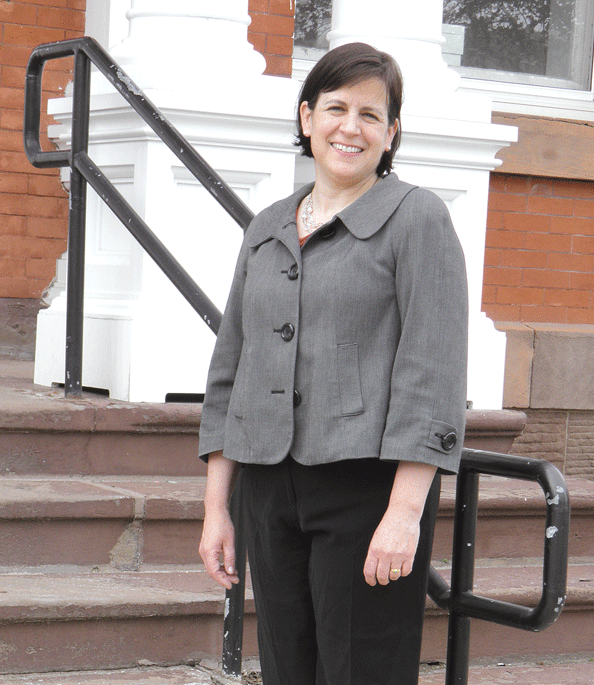 She was looking for a facility that was a step above adult day care and two or three steps above a community senior center — a place where medical care was available in the form of an on-site geriatrician, but where there was also a strong social component with a host of activities for a diverse group of seniors. She has found all this and a lot more at Summit ElderCare, a PACE (Program of All-inclusive Care for the Elderly) facility operated by Fallon Community Health Plan in Springfield’s North Medical District. The facility, which opened its doors roughly a year ago, now serves 53 individuals with roughly the same needs as Helese. They are called ‘participants,’ rather than ‘clients,’ ‘patients,’ or ‘customers,’ because that term best describes what they are, said Kristine Bostek, vice president and executive director of Summit ElderCare. Elaborating, she said they are participating in a program, based on a national model of coverage recognized by both Medicare and Medicaid, that provides medical care, geriatric case management, care coordination, adult day health services, full insurance coverage (including Medicare Part D prescription coverage), and in-home support in a personalized setting that features interaction with other seniors and a host of activities. All of this resonated with Pam White. “My mother is a very social person, and what appealed to me is that there would be other seniors involved in this program,” said White. “I wanted to engage my mother in a program where they have activities, and where it’s obviously a safe environment. Kristine Bostek says Summit ElderCare calls those it serves ‘participants’ — rather than clients, patients, or customers — because that word best reflects what they are. The Springfield location is one of five now operated by Summit ElderCare in Central and Western Mass., said Bostek, adding that the company started with a location in Worcester in 1995 and eventually added a second facility in that city before eventually expanding into Charlton and Leominster. Further expansion into the Merrimack Valley is now under consideration. An assessment of the Western Mass. 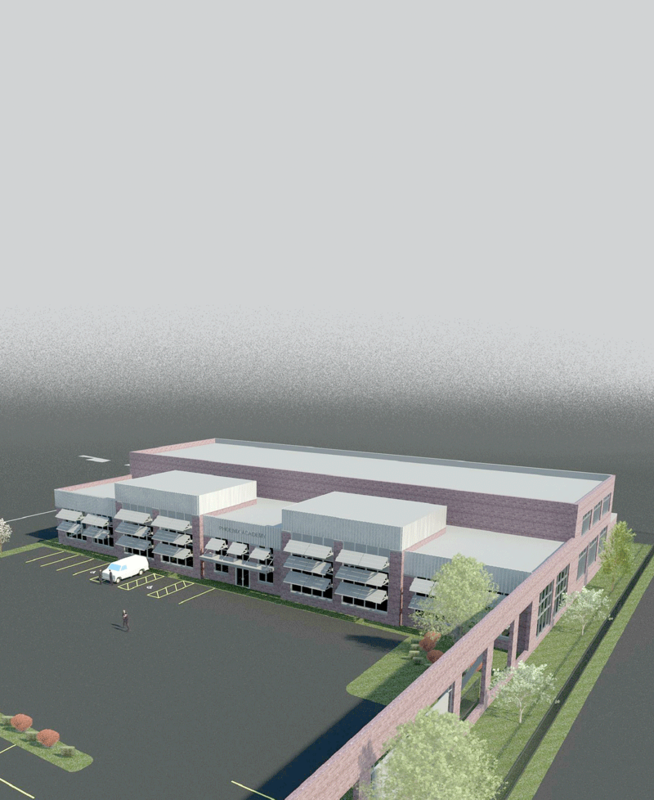 market several years ago revealed a need for a PACE facility there, said Bostek, noting that, after consideration of several possible landing spots, the company eventually chose a location in Springfield in a new medical building on Wason Avenue built to Fallon’s specifications. One year after opening that site, the company is on target with regard to growth, said Mary Woodis, RN and site director, adding that this location will likely hit its goal of 250 participants within three years. For this issue and its focus on the business of aging, BusinessWest takes an in-depth look at Summit ElderCare’s Springfield facility and how it is improving the quality of life for both participants and their caregivers. Bostek told BusinessWest that the PACE concept is gaining considerable traction across the country, with more than 100 sites currently operating nationwide. Fallon is now the fifth-largest PACE provider in the nation, with 900 total participants, and the largest in New England, she said, adding that the company is a firm believer in this model of healthcare because it provides a viable option to more expensive nursing-home care, and will only become more popular as the population ages because of the many benefits it provides for people like Helese — and the peace of mind it offers to those like her daughter Pam. The concept was described by both Bostek and Woodis as a “community-based alternative to nursing-home care,” and one with two critical elements: a healthcare component and a social component, which are both considered critical in the delivery of complete care to a participant. • Full medical and prescription drug coverage. The model has met with a good deal of success in Central Mass., as evidenced by the steady base of expansion, said Bostek, adding that, by the start of this decade, the company was actively pursuing opportunities to bring the concept to other parts of the state. Mary Woodis says people come to the program for their medical care, but also for the social aspects. The current mix of participants includes individuals across a broad age spectrum, said Woodis, adding that many are in their 60s, while a few are in their 90s, and there’s one centenarian. Some have cognitive issues, such as dementia or Alzheimer’s, while others do not, and there is a growing number of what would be considered younger seniors with neuromuscular disorders such as MS and ALS. “A PACE participant, in general, is a frail, older adult,” said Dr. Alison Grover, the on-site gerontologist at the facility. “They probably average in their low 80s with multiple medical problems and usually some difficulty with mobility and self-care. Summit Eldercare makes this possible by providing that one-stop shopping Pam White described. Elaborating on this concept, those we spoke with all used the phrase ‘integrated model of care’ to describe what’s offered, meaning both medical care and the many social aspects of the PACE program available at the Wason Avenue facility. It is this “complete package,” as Grover called it, that separates Summit ElderCare from a typical senior center and adult day care facilities, and also enables older adults to stay out of nursing homes. Woodis said activities run the gamut from arts and crafts to computer classes; from reading in the facility’s small library to healthy-cooking classes. On the day BusinessWest toured the facility, a Mother’s Day tea was in progress. Participants helped create tissue-paper flowers and also baked pies for the attendees. The key to effectively providing this integrated model of care is teamwork, said Grover, and there are many members on the team, including nurses, physical and occupational therapists, a nutritionist, social workers, a transportation coordinator — who oversee work to get participants to and from appointments — and others. Each day starts with a team meeting, she went on, one that essentially assesses the immediate needs of the participant population and creates an action plan. This is an effective model, but one that many in this region don’t know about, said Bostek, adding that, to meet established goals for growth, the company must build awareness about the PACE concept. Meanwhile, it must also be diligent and imaginative when it comes to outreach and building relationships with individuals and agencies that might refer potential participants. Those constituencies include senior centers and ASAPs (aging service access points), agencies that serve the elderly, as well as hospitals, primary-care physicians and specialists, elder-law attorneys, senior housing complexes, food pantries, and others. “We really work hard to be very visible in locations where there would be a large older adult population, as well as a low-income older adult population,” said Bostek. “We do some marketing, but it’s really a grassroots approach that we take. Caregivers are a very important piece of this outreach process, Bostek continued, citing statistics showing that one in three Americans serve as caregiver to a spouse, older relative, or friend, and many, like White, face considerable challenges as they take on that assignment. Grover agreed, and cited the caregiver of that aforementioned centenarian as a good example. There were not many alternatives for Pam White as she searched for a program that would allow her to keep working and also enable her mother to remain in her home and out of a skilled-nursing facility. The program offered by Summit ElderCare has proven to be the solution sought by both mother and daughter, and this story is now being repeated on a regular basis at the Wason Avenue site. These developments clearly show that the company has become a PACE setter, both literally and figuratively. Jean Deliso, left, and Trina Moskal take pride in educating people about measures they need to take to become financially secure. Jean Deliso has always asked questions — lots of them. The habit began in childhood during dinnertime conversations that revolved around her family’s business, and it continues today in her role as a comprehensive financial planner. Queries are important to the president and founder of Deliso Financial and Insurance Services in Agawam because the answers she receives are key to creating individualized plans for clients. But she says retirement planning is something many people fail to do, even though life expectancy is much greater than it was years ago and company pensions have all but disappeared. This is especially true for business owners and women, who tend to put retirement planning on the back burner, citing lack of time, resources, or knowledge as excuses. And although Deliso has clients from all walks of life, she has chosen to focus on these two populations. “I really enjoy empowering women and watching them gain a sense of accomplishment by taking steps to secure their financial future. This is especially true when I see women who have just come through a divorce or the loss of a spouse,” Deliso said, adding that she works with many women who are experiencing a life transition. Deliso noted that 90% of people in nursing homes are female, and 36% of women 65 and older are widowed, compared with 12% of men 65 and older, according to the U.S. Census Bureau. Women also make up half of the U.S. population, represent nearly two-thirds of the American workforce, and are the sole or primary breadwinner in 40% of households with children. Deliso said a woman turning 65 today can expect to live to age 85. The 2010 Census counted 53,364 people age 100 and older in the United States, and for every 100 women who are centenarians, only 21 men have reached that age. As for business owners, Deliso said many of them have their own reasons for failing to create a financial plan. Other rationalizations include a lack of money or discretionary income. “But everyone can plan, and everyone can save. It’s a matter of priorities,” she added. For this issue, BusinessWest examines how Deliso, by asking all those questions, helps clients establish priorities and, ultimately, plan effectively for both today and tomorrow. Deliso’s business education began in childhood. “My grandfather and parents were entrepreneurs who founded their own businesses, and I was washing windows at my parents’ company, ToolKraft, when I was about 7,” she explained. So she earned a bachelor’s degree in accounting, moved to Florida, and worked for a CPA firm. Although Deliso was slated to become a partner, after eight years she made the decision to leave. Seven years later, the two companies merged, and Deliso returned to Massachusetts. “I was in my 30s and wanted to start a family,” she explained. Her next stint was selling long-term-care insurance. But she soon found the work unsatisfying. “I didn’t like the fact that I was just selling a product. I thrive on relationships and wanted something more comprehensive,” she explained. So, when she received a job offer from New York Life Insurance, she accepted it, and discovered she enjoyed building relationships that helped people. Then, in 2000, Deliso founded her own company. Deliso Financial and Insurance Services has prospered since that time, and three months ago, junior associate Trina Moskal was hired to help with the growing clientele. Deliso said that, when her associate began working, she was surprised by the amount of time spent Deliso spent with clients. But she reiterated that it’s necessary to get to know them and understand their beliefs, expectations, needs, relationships with family members, job, attitude toward spending, as well as the amount of money they will need to live comfortably in retirement. Deliso is passionate about financial education, and says many working adults allocate a percentage of their paycheck to a retirement fund, but don’t understand how it is being invested. “People throw money at retirement like it’s going into a big, black box,” she said. “But they never look into the box and don’t calculate if there will be enough to pay their bills in the future. It’s important because people are living longer and can spend as many years in retirement as they did in the workforce. However, money evokes emotions, and financial decisions are not always rational. For example, a person’s primary goal may be to pay off their home mortgage by the time they retire. In other instances, money is spent for purely emotional reasons, which Deliso says can be fine. “A person who has gone through a divorce may need to take a vacation or get away even though they can’t really afford it,” she explained. But people do need to think about their future and plan for the unexpected. Early in her career, it became clear to Deliso that women were an underserved population in the financial world, and she was determined to do something about that. And they need to understand these things, she went on, because statistics show clearly that people are living longer in general, and most women can expect to live longer than their husbands. As a result, she goes above and beyond to educate women, and has conducted free seminars for this constituency for the past 10 years. Her next free talks, titled “Creating Financial Independence,” are slated for June 5 and June 19 from 5:30 to 7:30 p.m. at the Delaney House in Holyoke; call (413) 785-1100 to register. Overall, there are many facets connected to spending and saving, and Deliso says everyone has a relationship with money that stems from their own history — and often begins in childhood. She added that many people don’t understand the difference between a financial planner and an investment banker. “The planner looks at the overall picture and competing needs of a person, while the banker focuses more on the investments,” she told BusinessWest. Her clientele includes many business owners who appreciate the fact that she can speak their language. “Because of my background, I understand cash flow, budgets, sales projections, payroll, receivables, and inventory,” she said, adding that she has helped develop succession plans as well as company-sponsored benefit plans. She also continues to devote time to education. Her work has earned her many awards, which hang on the walls of her office and include an appointment to the Million Dollar Round Table, a benchmark of achievement for insurance agents. She is a registered representative with NYLIFE Securities and a registered investment adviser with Eagle Strategies LLC. To wit, she is chairman of the board at the Community Music School and a member of the board of Dakin Pioneer Valley Humane Society, the Baystate Health Foundation, AAA of Pioneer Valley, Pioneer Cold, the Hampden County Estate Planning Council, the National Assoc. of Life Underwriters, and the Assoc.for Advanced Underwriting. She is also a past chairman and board member of the YMCA of Greater Springfield, the Bay Path Advisory Council, the Executive Women’s Golf Assoc., and the Community Foundation. Which means Deliso will continue to ask questions so she can bridge the gap between the present and the future to ensure that clients achieve financial independence without having to sacrifice the things that matter most. When BusinessWest first presented the Western Mass. Business Expo in October 2011, the immediate goals were to catch the region’s attention, re-energize a concept that had become stale over time, and lay the groundwork for an event that would become an important part of the fall landscape in Greater Springfield. Three and a half years later, it’s safe to say that those goals have been met. Indeed, the term ‘Expo’ has become part of the local lexicon, attendance continues to grow with each edition of the show, and the level of energy on the show floor at MassMutual Center continues to increase. Keeping the needle moving in these directions is a daunting challenge, but this was the assignment BusinessWest gladly accepted in late 2010, said Kate Campiti, the magazine’s associate publisher and sales manager, and it’s one that continues to motivate the staff. With that in mind, planning for this year’s Expo, which is expected to feature more than 150 exhibitors and draw more than 2,500 attendees, began days after the curtain came down on the 2013 event, said Campiti, adding that a number of component parts of the show are falling into place. The Affiliated Chambers of Commerce of Greater Springfield and the Professional Women’s Chamber will again stage the breakfast and lunch programs, respectively, she noted, while Northwestern Mutual has signed on as sponsor of the popular day-capping Expo Social, ensuring that it will continue to be one of the best networking events of the year. As Kane mentioned, education is an important facet of the Expo. Over the years, the event has featured insightful keynote speakers, panel discussions, and seminar leaders, and more of the same is on tap for 2014. In the weeks and months ahead, details of specific show programs will be presented in this space. In the meantime, area business leaders, educators, and nonprofit managers are invited to submit proposals for seminars and Show Floor Theater presentations that they can lead. In addition to Northwestern Mutual and presenting sponsor Comcast Business, a number of other area companies have signed on as Expo sponsors. These include silver sponsors Health New England, Johnson & Hill Staffing, and DIF Design, and education sponsor, the Isenberg School of Management at UMass Amherst. Additional sponsorship opportunities are still available, said Campiti. For more information on the Expo, to register for the show, or to purchase a booth, call (413) 781-8600, e-mail [email protected], or visit wmbexpo.com. Betsy Andrus says Great Barrington culture and art venues draw thousands of people to the town each year. “It’s a really exciting time, and things are just going to get better with all of the projects and investments that are being made here,” said the town planner, noting that the community’s walkable downtown — featuring a Main Street that bustles with business in small shops and eateries — has been extended in the past year, thanks to businesses and developers who purchased and are renovating and moving into historic buildings. Meanwhile, the village of Housatonic, just outside downtown, is also experiencing growth as small businesses expand, restaurants open their doors, and old mills become sought-after locations for commerce. But the vitality that the hub of the Southern Berkshires is known for has been carefully crafted. Rembold agreed and said the key element in the plan is promoting locally based growth. “Many of our buildings and downtown businesses are owned by people who live in Great Barrington, and although they may not employ a lot of people individually, together they employ a great number,” he said. “These business owners are active in our civic organizations and contribute to our nonprofits and our award-winning Fairview Hospital. Small businesses tend to be resilient, and almost every business has relationships with other businesses and with our banks, which makes for a tight-knit community. However, Tabakin said opportunities to establish new businesses or expand still exist in publicly and privately owned property. 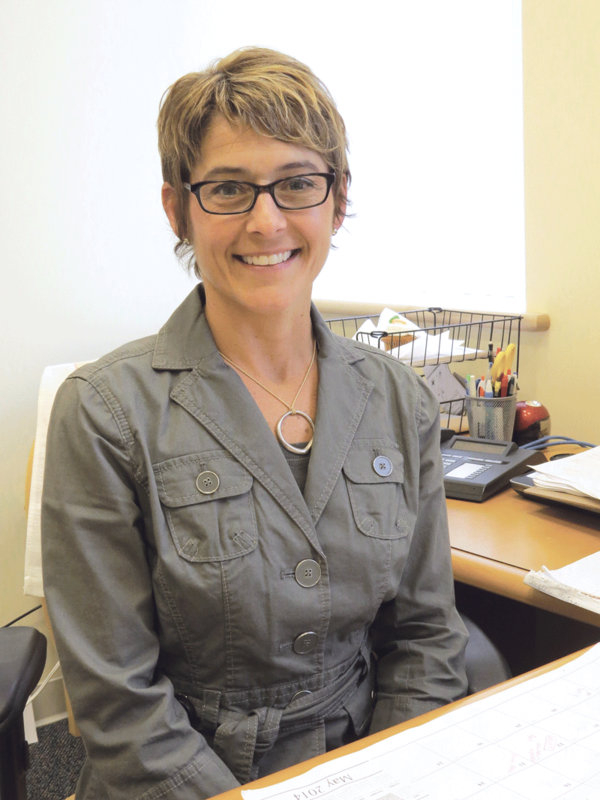 “We hope to attract companies that will employ younger people,” she added, noting that the town’s population contains a high percentage of retirees, and officials would like to attract more members of the younger generations to the community. For this, the latest installment of its Community Spotlight series, BusinessWest examines the many positive developments in Great Barrington, and how that wave Rembold described is just starting to build. The success of the local businesses that dominate the Great Barrington economy is fueled by a number of factors, which include an active arts community, the town’s location — near the New York border and not far from many other destinations in the Berkshires — and its plethora of small shops and boutiques. Many of these ventures have expanded, and some have earned national recognition. He added that Salisbury Bank is another example of a business that has chosen to invest in Great Barrington’s downtown. “They opened a new branch on Main Street last week. They renovated an old structure because they wanted to be downtown in a historic building. And the Barrington Boutique, a bed and breakfast with an artistic look, also just opened. It covers the entire third floor of an historic building, and they put in an elevator. Jennifer Tabakin says the town’s master-plan framework earned the prestigious American Planning Assoc. Massachusetts Chapter Award. Betsy Andrus, executive director of the Southern Berkshire Chamber of Commerce, concurred. 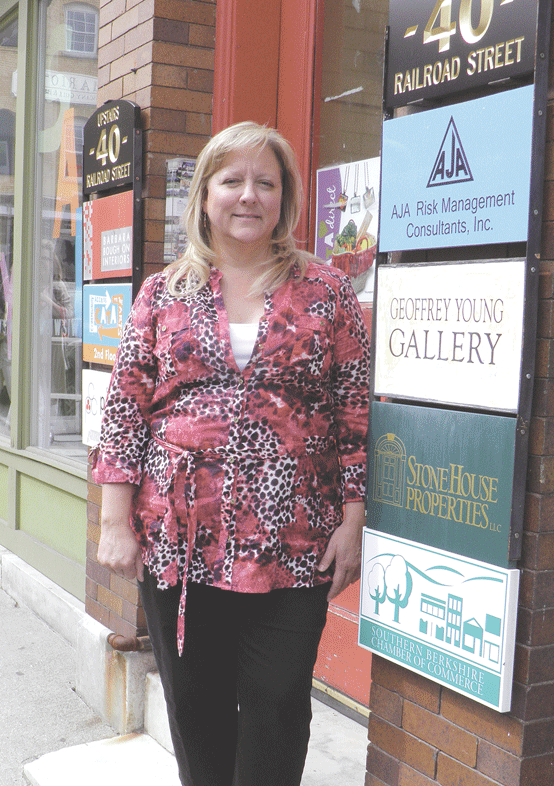 “A new furniture store is about to move in on Main Street, and over the past three months, the chamber received three calls from store owners who wanted to find space in Great Barrington,” she said. Shoppers appreciate the fact that the town issues its own currency, called Berkshares, which can be purchased at local banks. “It’s popular because it gives people a 5% discount when they are shopping. The program has recently expanded, and architects, printers, and other business people also accept Berkshares,” Tabakin said. Andrus said the walkable downtown area, which is intersected by side streets housing small businesses, is always bustling with activity. “Nothing stays vacant for every long. Things move very quickly, and in the past year Main Street has seen huge renovations,” she told BusinessWest. Although most downtown storefront space is occupied, space zoned for business use is available in a number of other locations, including three former schools on the Searles/Bryant campus on Bridge Street. “The river runs behind the buildings, and Iredale Mineral Cosmetics, which is one of our biggest companies, is in the former middle/high school. The complex is noteworthy because it’s LEED-certified,” Tabakin said, adding that it was the first project of its size to receive the LEED Gold designation in Southern Berkshire County. 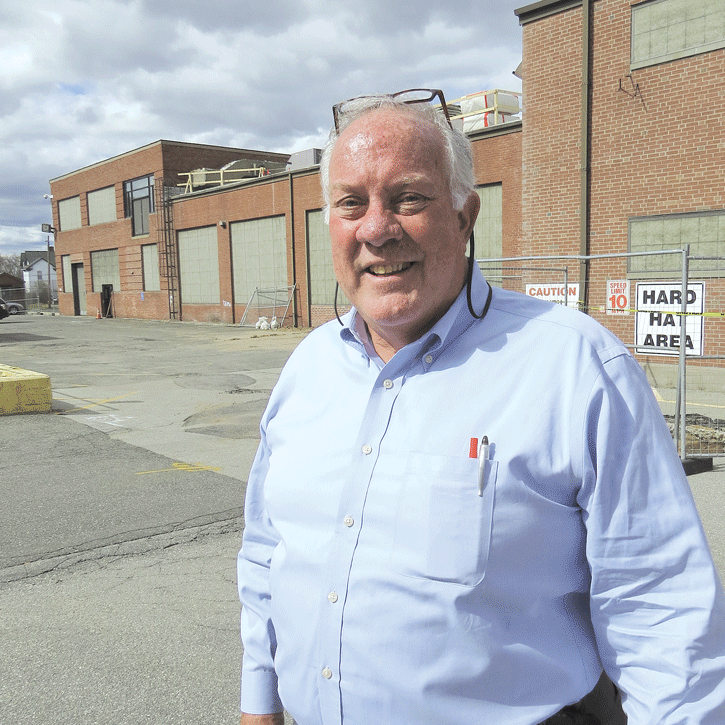 The village of Housatonic has also witnessed development activity, as businesses have chosen to locate or relocate in three former mills in the Monument Mills Complex. “All of the mills are partially occupied by businesses that are leaders in their field, such as Country Curtains and Berkshire Pulse,” Rembold said, adding that the latter is an arts center that serves 650 students. It leased the first two stories of the former Barbieri lumber operation for six years, but moved into larger studios in the Rubin Mill building across the parking lot from its former location earlier this month. A new restaurant called Pleasant and Main also opened last month in Housatonic, and Rembold tells businesses who are contemplating a move to Great Barrington not to hesitate if they find a suitable spot. “It is so vibrant that, if anyone waits, the space may be taken,” he told BusinessWest. Tabakin said town officials continually look for opportunities to tap into state and federal monies, and do their best to alert business owners and nonprofits about available programs. Andrus said the former St. James Church on the south end of Main Street was recently purchased and will become a performance space, thanks to a grant from the Massachusetts Cultural Council. The arts community is thriving in Great Barrington, and thousands of visitors are drawn to the town each year due to its cultural attractions, which include the renowned Mahawie Performing Arts Center. “There are an endless number of cultural organizations within a mile of downtown, including the Daniel Arts Center at Bard College, the Berkshire Playwright Lab, and the Community Access to the Arts,” Andrus said. Great Barrington is also breaking new ground in the emerging farming and agriculture sector of the Southern Berkshires, and Rembold said the town’s more than 70 restaurants provide an important outlet for farmers selling produce. Meanwhile, Wired West, an organization focused on expanding fiber-optic broadband, also expanded into Great Barrington within the past year. In addition, demand for housing is on the rise, especially for single-floor living. A new development called Barrington Brook, which will be made up of 44 single-floor condominiums and homes, was permitted last year, and the model unit is expected to open soon. Tabakin said the town’s popularity and desirability continues to grow. In addition to drawing tourists and people from the Southern Berkshires who do their shopping and business there, “we have had six calls this year to do film shoots here,” she noted. They include the seven-minute film “Selfie,” which has gone viral and is a testament to the life and people who work and reside in a town whose name and reputation continue to rise. Steven Lowell fashions himself more than a banker. He’s also a teacher of sorts. “One of the things that has become clear to us over the past three or four years is that, when it comes to financial literacy, not everyone has a good understanding of how to manage their finances,” said Lowell, president of Monson Savings Bank. “I get a chance to see it on a day-to-day basis, and you’d be surprised,” he added, citing the Financial Literacy Survey conducted last year by the National Foundation for Credit Counseling, showing that 40% of the public would grade themselves a C or worse when it comes to their financial literacy. When Lowell took the reins at MSB three years ago, the bank already had accounts targeted at young people, such as its NextGen Checking for teenagers and college students, but realized he needed to do more. The learning doesn’t stop there, though. Monson Savings Bank has cultivated a reputation for educating the community, whether it’s through public seminars on topics like first-time homebuyer programs, special-needs trust, and long-term-care insurance, or through the bank’s relationship with the Massachusetts Financial Education Collaborative and its online financial-education program, masssaves.org (more on that later). “The bank was doing some of this already, but I’ve always had an interest in the education part of the job — not only outside the bank, but teaching the folks inside, too,” Lowell told BusinessWest. “I had a great mentor, and I’ve tried to take on that role for a number of individuals who work for me. MSB as a whole has experienced new life under Lowell, who has continued the impressive growth pattern of his predecessor, Roland Desrochers, who saw the bank increase its assets from around $80 million to $236 million in 15 years. Three years after Lowell took over, that number is $272 million. “We’ve had about 6% to 7% growth every year,” he said. 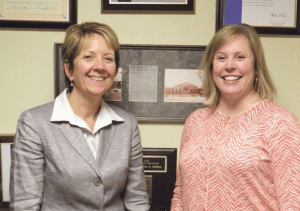 For this issue’s focus on banking and finance, BusinessWest sits down with Lowell to talk about the specific ways in which Monson Savings Bank is growing its financial clout while maintaining its tradition of community engagement — and its ongoing efforts to create a more financially savvy customer base. Monson Savings Bank’s most notable recent success may be its commercial-lending operations, which earned recognition from the Small Business Assoc. as the Western Massachusetts 7a Lender of the Year. The SBA noted that the bank loaned to a wide variety of retail, professional, and consumer-service businesses in more than 10 different industries, from transportation and construction to healthcare and childcare. MSB has expanded over the past two decades from its original Monson location to branches in Wilbraham, Hampden, and Ware. On both the commercial and retail sides, Monson Savings Bank has embraced new technology, Lowell said, entering the mobile-banking arena two years ago — customers can even transfer money between MSB and another bank on their smartphones — and introducing remote check deposit last year. Meanwhile, the bank continues to grow its investment arm, offering products through Infinex Financial Services and regularly ranking in the top 20% of all Infinex banks, typically first or second among banks in its asset range. At the same time, MSB expanded its geographic footprint last year, opening a branch in Ware to go along with offices in Monson, Wilbraham, and Hampden. With that growth, however, has come increased challenges — for all banks, really — from regulatory bodies, much of it stemming from the financial crash of 2008, leading to Monson’s hiring of a full-time compliance officer. While bank executives are educating themselves on these new compliance issues, Lowell continues to stress community outreach and financial literacy. Through a connection forged while serving on the board of the United Way, he became involved in the Hampden County Financial Stability Network, which introduced him to the Massachusetts Financial Education Collaborative (MFEC), a group of nonprofits, private institutions, government agencies, and other bodies that work together to increase economic stability in Massachusetts through financial education, personal savings, and access to wealth-building assets such as homes, cars, college educations, and small business. “These folks have got a great program, which they offer online — financial coaching for people in need,” he said of the MFEC project known as MassSaves and its online resource, masssaves.org, which offers financial information and a portal to one-on-one financial coaching via phone, e-mail, and Skype. 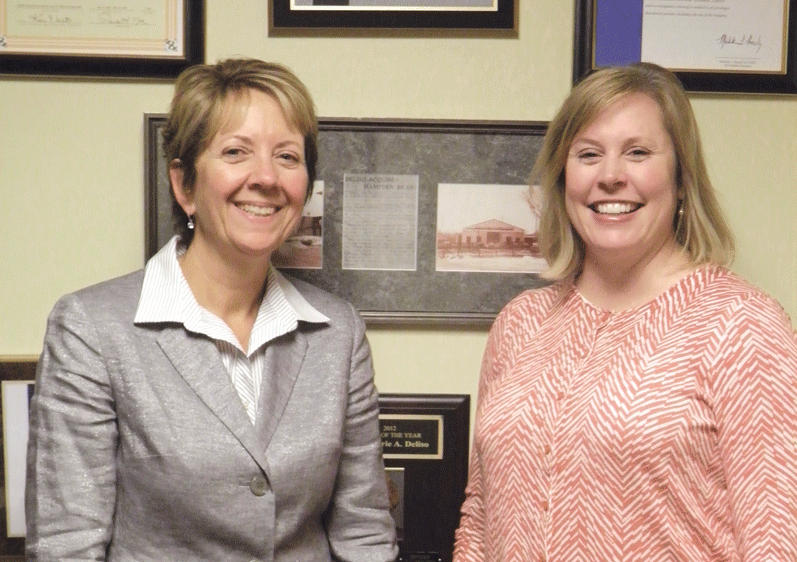 Monson Savings Bank has invested in its communities in other ways as well, most notably through annual donations of more than $100,000 to various nonprofits. “The year that I arrived was the first year we actually asked the community to help us select some of the agencies or benefactors that would receive some of the funds,” he told BusinessWest, adding that the bank solicits nominations on Facebook, and the top 10 vote getters receive donations.